Some of the most memorable of characters to appear in the stories of Ancient Greece were the monsters encountered by gods and heroes, with a monster often overcome to prove the worth of an individual. Many of the monsters of Greek mythology are well known today, and amongst the most iconic of these ancient beasts is the many headed Lernaean Hydra. The Lernaean Hydra was the monstrous offspring of Echidna, the mother of monsters, and Typhon, the most powerful of all monsters in Greek mythology. This made the Lernaean Hydra sibling to other notable monsters, including the Chimera, Cerberus and the Colchian Dragon. The Lernaean Hydra was not raised by Echidna though, for the monster was taken into the care of the goddess Hera, and raised for one particular purpose, for Hera was plotting the demise of Heracles, the illegitimate son of Zeus, Hera’s husband. In the broadest sense, the Lernaean Hydra was considered to be a sea snake, but the Hydra was not a normal water serpent, for it was gigantic in size. ​The Lernaean Hydra is of course famous for its numerous heads, and whilst occasionally it was said to have had 50 heads, it was more common to depict the Hydra as having nine heads, eight mortal and one immortal. Each of these heads was also dead to exhale deadly gases. Hera would establish a home for the Hydra in Lerna, hence the given name of the monster. Lerna was the name given to a region found on the eastern coast of the Peloponnese, south of Argos. The region was especially noted for its lakes, springs and swamps, these being gifts from Poseidon, and initially for the purity of the freshwater found there and its healing properties. The other important aspect of Lerna in antiquity was the fact that the region was also home to one of the entrances to the Underworld, the realm of Hades. Nominally the role of the Lernaean Hydra was to guard this entrance to the Underworld; and any unwary traveller was likely to be killed by the monster. The presence of the Lernaean Hydra in the waterways of Hydra though, also resulted in the bountiful freshwater becoming undrinkable, as the poisonous gasses released from its heads contaminated all of the water. The Lernaean Hydra of course became famous because of the adventures of the Greek hero Heracles. Heracles was undertaking a period of servitude to King Eurystheus, and the king of Mycenae, through the cajoling of Hera, was trying to kill him. Eurystheus had already set Heracles one seemingly impossible Labour, the killing of the Nemean Lion, and now the king set Heracles the task of killing the Hydra, and cleansing the water of Lerna once again. King Eurystheus of course believed, or at least hoped, that Heracles would be killed in the attempt. Heracles would travel from Mycenae to Lerna, and eventually located the Lernaean Hydra in one of its lair in an inhospitable swamp. Heracles, before attacking, first covered his mouth and nose in fabric, to circumvent the poisonous gasses emitted by the monster. Then Heracles took up his bow and arrows, and lighting his arrows one by one, took aim at the Lernaean Hydra. The arrows themselves did the Hydra no damage, but they did cause the monster to leave its lair, making it an easier target for Heracles. As the Lernaean Hydra approached, Heracles would drop his bow and take up his sword instead; and with one swipe, a head of the Hydra was decapitated. Something that should have proved advantageous to Heracles though soon became a disadvantage for from the open neck wound, the Lernaean Hydra grew two new heads fully formed. Heracles briefly retreated to plan his next move, but it was actually Iolaus, Heracles’ nephew and armour bearer, who came up with the solution to the hero’s problem. 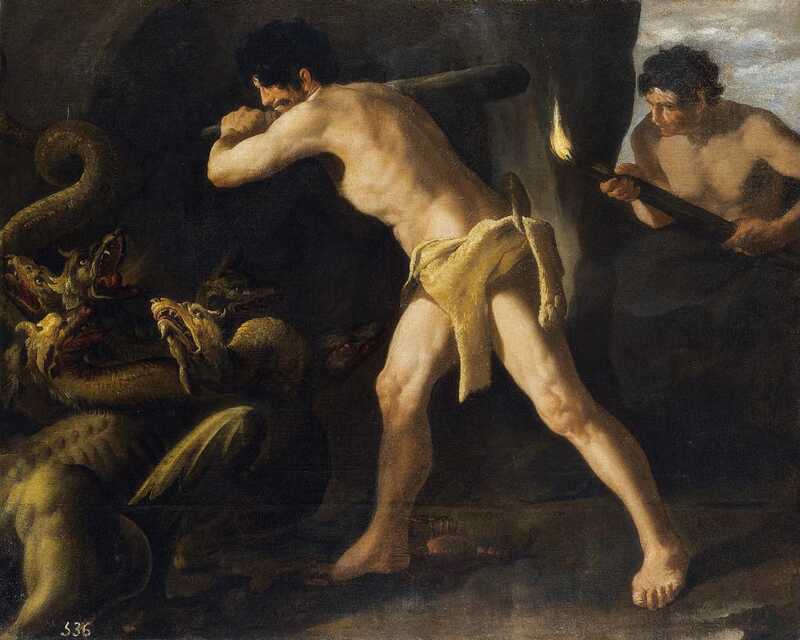 Iolaus suggested that the open cuts should be cauterised before a new pair of heads could grow from it; and so Heracles, with sword, and Iolaus, with flaming torched went out to face the Lernaean Hydra. 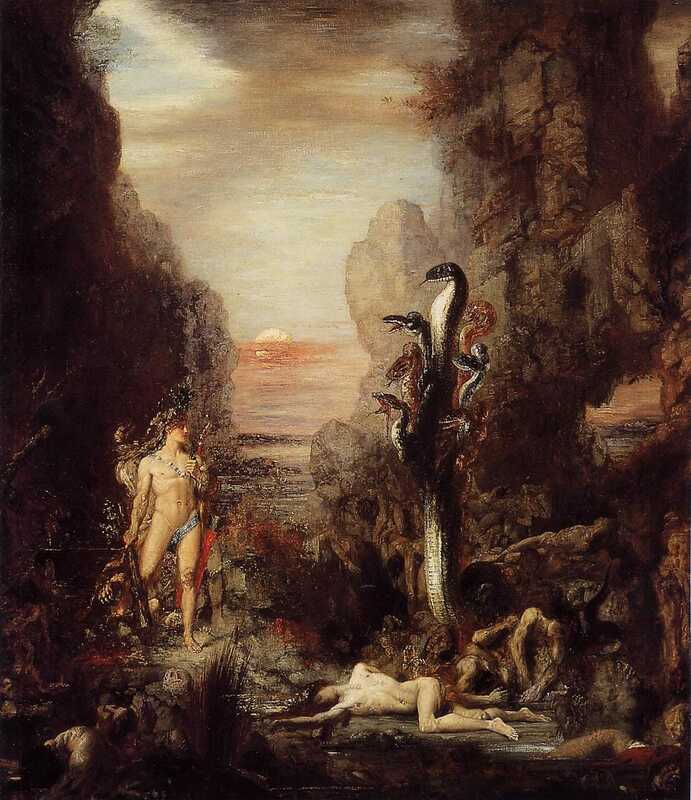 Thus, as Heracles removed a head, Iolaus would rush forward to cauterise the wound, and eventually only the single immortal head of the Hydra was left. The goddess Hera had been observing the fight between “her” monster and Heracles, and seeking to give the Lernaean Hydra an advantage, the Greek goddess sent a second monster to assist. This second Greek monster was a gigantic crab, Carcinus, but compared to the Hydra it was an insignificant monster, and although it did manage to grab the leg of Heracles, the hero simply crushed it beneath his feet. Heracles though still had the problem of how to deal with the final immortal head of the Lernaean Hydra, but thankfully Heracles had a friend in the form of his half-sister, Athena. Athena would present Heracles with a golden sword, and this sword easily allowed Heracles to remove the final head of the monster, killing it. This immortal head was subsequently buried by Heracles beneath a rock by the main road through Lerna. Hera would subsequently place the likeness of the Lernaean Hydra amongst the stars as the constellation Hydra; and also at the same time placed Carcinus as the constellation Cancer. Some also tell of how the Lernaean Hydra was actually resurrected to become a physical protector of the Underworld, alongside Cerberus. Heracles would subsequently make use of the blood of the Lernaean Hydra for thereafter the arrows of the hero were dipped in the blood, making them even more deadly. The effort of Heracles in killing the Lernaean Hydra, and the cleansing of the water, was discounted by King Eurystheus though. For the king claimed that the assistance of Iolaus made the Labour null and void, and so Heracles would have to perform an addition task, just as occurred with the cleansing of the Augean Stables.